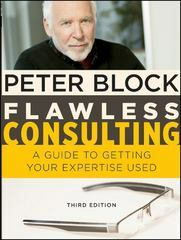 Flawless Consulting 3 Edition This Third Edition to Peter Block's Flawless Consulting addresses business changes and new challenges since the second edition was written ten years ago. It tackles the challenges next-generation consultants face, including more guidance on how to ask better questions, dealing with difficult clients, working in an increasingly virtual world, how to cope with complexities in international consulting, case studies, and guidelines on implementation. Also included are illustrative examples and exercises to help you cement the guides offered.